Proprietary Name: Chi Kung Huo Shiueh Kao What is the Proprietary Name? Non-Proprietary Name: Menthol, Zinc Oxide What is the Non-Proprietary Name? 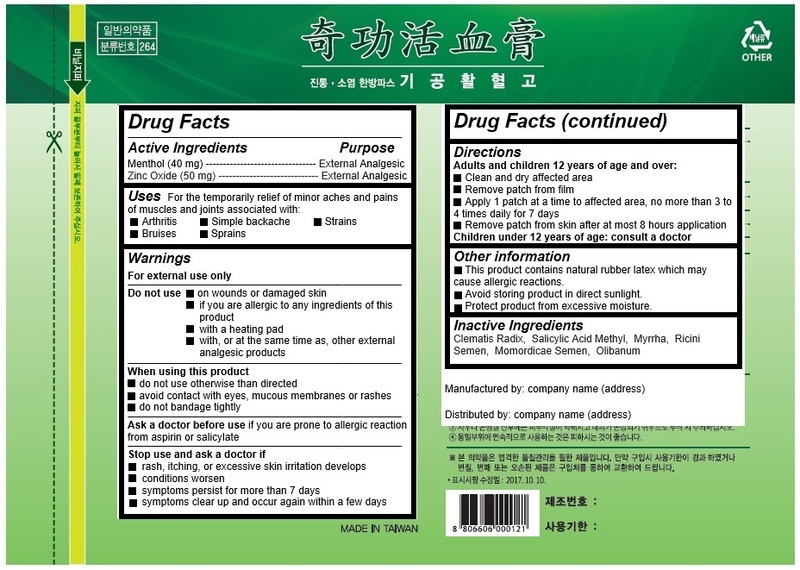 Chi Kung Huo Shiueh Kao with NDC 58354-112 is a a human over the counter drug product labeled by Cho-a Pharm.co.,ltd.. The generic name of Chi Kung Huo Shiueh Kao is menthol, zinc oxide. The product's dosage form is patch and is administered via topical form. • In case of overdose, get medical help or contact a Poison Control Center right away. Quick medical attention is critical for adults as well as for children even if you do not notice any signs or symptoms.